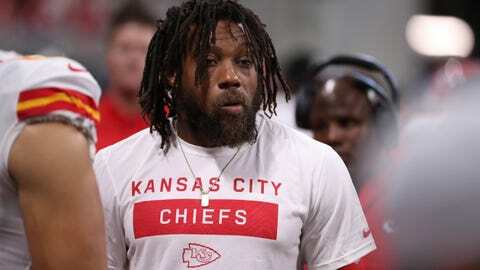 Eric Berry has spent this season primarily on the sideline -- until Wednesday. KANSAS CITY, Mo. — Eric Berry was back on the Kansas City Chiefs’ practice field Wednesday for the first time since early in training camp, the first step toward the star safety being ready for games. When that could happen remains unclear. Berry tore his Achilles’ tendon in last season’s opener but was back on the practice field over the summer. He began training camp and looked as if he’d be ready for the season but then was sidelined by a troublesome heel problem that seemingly nobody completely understood. Chiefs coach Andy Reid kept calling Berry “day to day,” even as it stretched to week to week and month to month, and has maintained ever since August that he was slowly getting better. It seems unlikely that Berry will be ready by Sunday, when the Chiefs (9-2) play their first game after a bye in Oakland. But there will be four more regular-season games, and getting Berry up to speed in time for what Kansas City hopes is a deep playoff run is most important. The five-time Pro Bowl selection certainly knows how to make a comeback. Berry missed most of a season earlier in his career when he tore knee ligaments, and the injury to his Achilles tendon scuttled another season. Berry also missed the end of a season when he was diagnosed with cancer, only to be declared cancer-free by the following summer in time for training camp. Berry has been around the team all season, juicing up the defense while helping a young secondary as a pseudo coach. He’s been in meeting rooms, traveled to road games and maintained a constant presence in the locker room, where his stuff is hung close to rookie quarterback Patrick Mahomes. The Chiefs have struggled at safety all season, signing veteran Ron Parker on the eve of the season because they were so short-handed. Daniel Sorensen broke his leg in training camp and only recently was back on the field, and rookie Armani Watts landed on injured reserve as he was getting up to speed. Not surprisingly, the Chiefs have been gouged by opposing offenses most of the year. They are allowing more than 400 yards and 26.7 points per game, both near the bottom of the league. Their pass defense is last at 297.2 yards per game, and their inability to get stops in the red zone has been due in part to the unsteady play of their safeties. But beyond the physical boon Berry would provide is the emotional lift. Yes, he’s been around the team all season. But offensive lineman Mitchell Schwartz said there’s a different feeling when one of the team’s longest-tenured and most vocal leaders suits up. NOTES: C Mitch Morse (concussion) returned to practice for the first time since getting hurt Oct. 14 in New England. … WR Sammy Watkins (foot) remained out of practice. He played a few snaps against the Rams before the bye before deciding that the injury was too severe to continue. It’s unclear when he will be ready again. … Reid gave a shout-out to Sporting Kansas City, the MLS club that plays Portland on Thursday night in the Western Conference finals. “Great for the city,” he said.